Having suffered from a liquidity crisis in 1995, Paraguay is going to great lengths to ensure it’s seen as an ample investment opportunity. A host of financial reforms as well as thriving economic circumstances are just a small part of the country’s attempt to demonstrate huge potential for growth and encourage businesses to invest in Paraguay. Paraguay’s banking and financial services industry has recovered well from the 1995 liquidity crisis, when news of pockets of corruption resulted in the closure of several banking institutions. Today, manifold reforms instituted by the International Monetary Fund (IMF) and World Bank have helped to restore a great deal of credibility to Paraguay’s banking industry. The aim is to draw interest from savvy business people keen to invest in Paraguay, and to market the nation as a key business destination. Today, Paraguay’s Central Bank of Paraguay stands as an institution with the aim of stabilising the country’s financial sector, ensuring that similar situation to the 1995 crisis does not repeat itself. The Superintendencia de Bancos regulates the banking system, monitoring everything from liquidity to solvency and capital adequacy. Paraguay’s economy is driven by its robust agriculture and cattle farming industries, together with large re-export activity of imported consumer goods to neighbouring countries. These activities are carried out by a large number of SMEs, making the industrial landscape of the country slightly fragmented. Recent growth has been very strong. 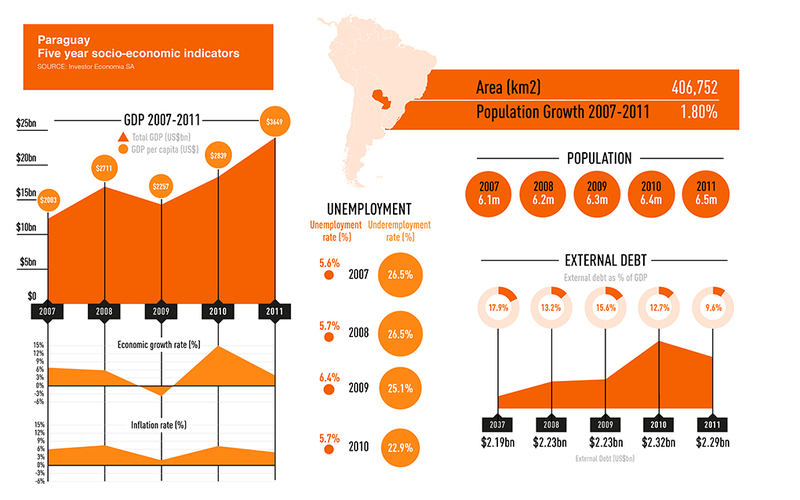 In 2010, Paraguay recorded economic growth of 15.3 percent – the highest in Latin America. One of the country’s key messages is that it is looking for new strategic partners to invest in Paraguay to help the nation achieve its full growth potential. Furthermore, there are a number of key factors that are seen as pivotal in the development of the country as a destination for inward investment. In addition to Paraguay’s plentiful supply of high-quality agricultural land, it also has a massive potential for organic agriculture: it is the world’s largest exporter of organic sugar. There is real potential for growth in terms of agriculture. Today it is estimated that there are some 4.5 million hectares utilised by the mechanised cereal agriculture industry, but it is estimated that in the next decade as much as a further 80 percent more fields could be put to use. It has been estimated that Paraguay has the potential to become one of the leading exporters of meat. It is also a leading player in the renewable energy sector, being the global number one exporter of renewable energy. Paraguay has no net debt, and boasts a net cash-to-GDP ratio of 11.3 percent, which is an extraordinary achievement. The country attracts international firms to invest in Paraguay thanks to its attractive tax environment. This includes no restrictions on capital investments and capital movements, VAT and corporation tax rates of 10 percent, and a benign approach to FDIs. Also, in a study published by the Fundacion Getulio Vargas in Brazil, in Q2 2011 Paraguay ranked second on its Economic Climate Index, out of 11 South American countries; another incentive for those looking to invest in Paraguay. i) Offer financial solutions to the prosperous, yet fragmented, agricultural market, which has enormous potential. iii) Embrace the economic growth, in conjunction with the demographic trends in the country, in order to tap into new growth and revenue streams. iv) Attract FDI by highlighting the benefits and the relative ease of doing business in Paraguay. v) Capitalise on the balanced profile of the human capital of the country as defined by agricultural and service sector workers. Paraguay in the latter stages of the 90s, having developed and implemented a new regulatory framework and environment for the financial sector, together with a new map for the central bank, Paraguay witnessed a significant turnaround. At the beginning of 2003, Paraguay faced the risk of selective default on some of its international obligations. At the end of 2011, debt to GDP was around 9.5 percent with regular payments on its debt, almost all of it with multilateral organisations. 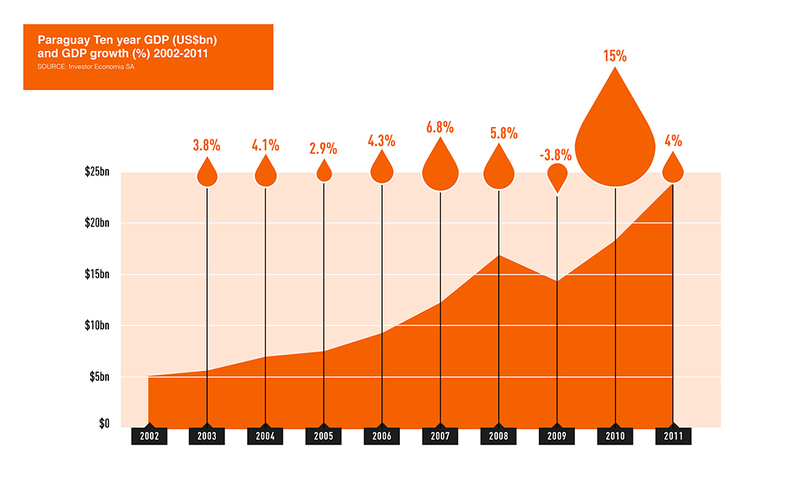 Similarly, the ratio of reserves to GDP has reached 20.8 percent at the end of that same year. In this context, since 2003, Paraguay has experienced a year-on-year CAGR of approximately 4.3 percent, making it a prime destination for businesses looking to invest in Paraguay. Furthermore, income per capital has increased from $950 to $3,649 over that same period and the country has not experienced a budget deficit since 2003. 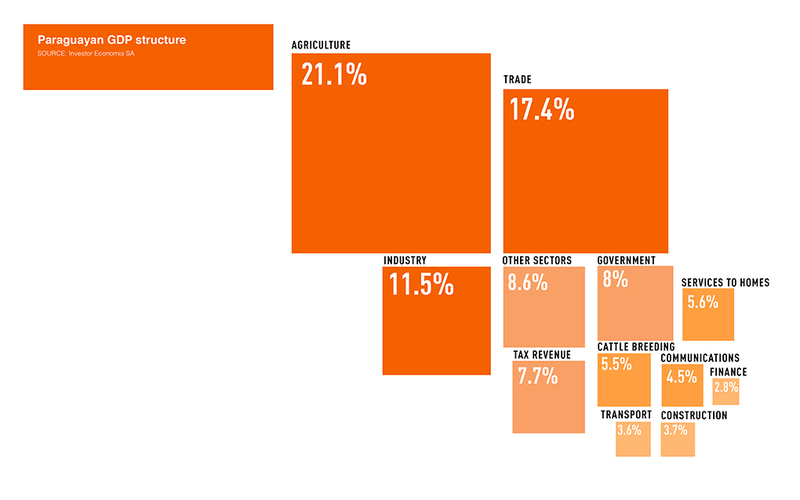 Paraguay’s macro-economic indicators of growth are underpinned mainly by the country’s primary growth sectors of agriculture and livestock, but are also bolstered by increased exports and the generation of new non-traditional exports of goods and services. Paraguay’s primary exports, including soybeans, meat, and organic sugar have placed Paraguay among the world’s leading producers/exporters in these segments. This offers great prospects to those hoping to invest in Paraguay. Import and export figures over the past few years tell their own story. In 2007, Paraguay’s exports in millions of US dollars were $2,745.1 and its imports $5,840.9 while 2008 saw a significant increase in Paraguay’s exports in millions of US dollars to $4,390 and its imports to $8,977.3. The figures went down to $3,167 for exports in 2009, while imports were $6,829.2. 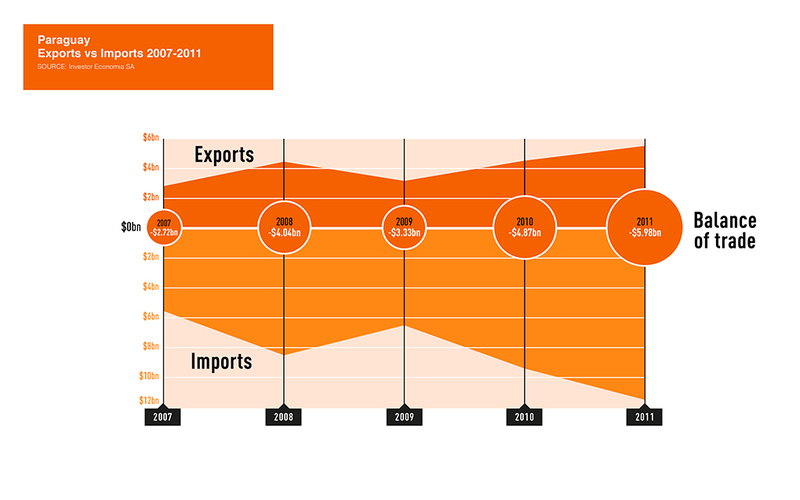 But in 2010 exports had returned to $4,555.5 above their 2008 levels, with imports $9,913.5. The growth continued, with exports in 2011 reaching $5,519.9 and imports $11,502.2. These factors, coupled with its limited exposure to global banking inter-dynamics, have helped shield Paraguay from the various global financial crises that have battered the more developed nations since 2008. Considering the macro-economic plus points, there is great potential for PPPs in Paraguay, and such initiatives are often seen as key in terms of attracting firms and businesses to invest in Paraguay. Today, a large number of international companies, operating across various areas of the infrastructure sector – including airport management, roads and highways, bridges, public transport and energy/utilities management – are keen to develop their investment activities in Paraguay. 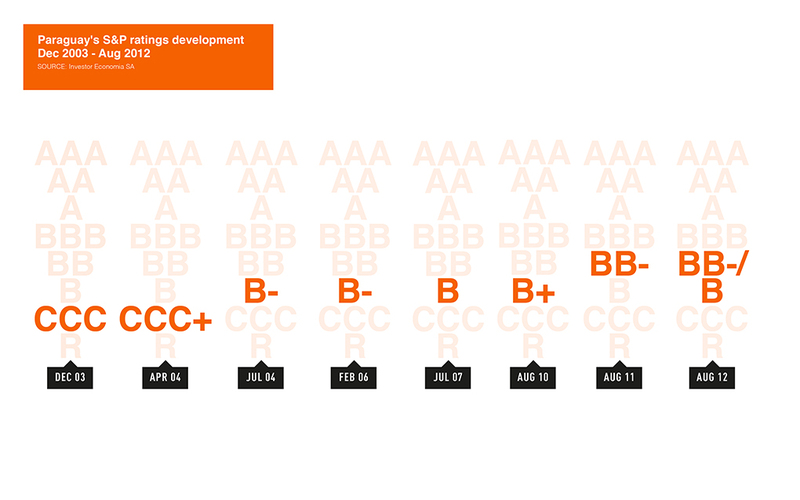 To date, as many PPP projects remain in their infancy, FDI has yet to appear with any real conviction in Paraguay. However, many leading economists believe that once the trickle starts the floodgates will soon open. One possible reason why FDI has not yet flourished could be the misplaced perception that Paraguay is a nation that is home to widespread corruption. But to those asking why now is a good time to invest in Paraguay, the answer is simple: Paraguay is making steady progress that is inviting to international investors. Paraguay has a sound and relatively easy financial system to navigate, backed by strong support and supervision from the central bank and regulators. A further attraction for investors is that Paraguay’s central bank consistently applies cautious regulations. Today both the regulator and the central bank are closely monitoring the development of the financial sector and are imposing drastic measures to ensure proper levels of regulation and enforcement. Lessons, it would seem have been learned across South America, and today Paraguay’s financial sector is more professional and more accurate in devising regulatory frameworks and enforcing them. Paraguay’s success is, therefore, in part due to the institutional, regulatory and fiscal changes implemented by the various governments during the past eight years. Monetary and fiscal stimulus measures have been employed swiftly, especially around the time of the 2009/2010 financial crisis, which placed the country back on an expansion mode. And such measures have worked. Paraguay has grown at the fastest pace of all South American countries since 2010, making it prime destination for those wishing to invest in Paraguay. Sudameris Bank is one of the leading financial institutions in Paraguay and is renowned for promoting the country’s many assets and advantages to potential investors. The bank, which offers clients a wide range of commercial and retail banking and insurance services and products, is aware of the challenges the country has faced in attracting investors, but it considers that now is Paraguay’s time to realise its potential. Abbeyfield Group currently holds a 98.5 percent stake in Sudameris Bank. Abbeyfield began to invest in Paraguay in 2004 and since then has constantly and consistently re-invested: first, in the bank, to support its growth, but also in the agro-industrial sector. In March 2011, it acquired the fourth-largest manufacturer of organic sugar in Paraguay. These investments demonstrate the extent to which Abbeyfield believes that Paraguay has potential for investments across a variety of sectors. Having grown exponentially over the past two-and-a-half years, Abbeyfield is currently analysing what it can do better to constantly improve the business and services to its clients and those looking to invest in Paraguay. The bank’s total assets have grown 31 percent in 2011 alone, reaching the objectives set up in 2009 one year earlier than planned. In the 2012 Banking Awards, World Finance recognised Sudameris Bank as the Best Banking Group, Paraguay. Sudameris has a number of major developments in the pipeline. For example, it is committed to developing and deploying a comprehensive electronic service offering for its clients, a project that is to be accompanied by staff training and customer service – all in, this is representative of its continued dedication to improving the quality of its customer service offering. One of Sudameris’ key strengths is its constant contact with its key clients, for which it organises conferences and meetings in order to keep them abreast of changes in the regulatory framework or macro-economic developments that may impact their businesses. They are a major proponent of investment in Paraguay as they believe in the country’s rise and evident progress. Lahaie says, “One of our key strength is to keep the relationships with our clients as close and personal as possible through regular contacts. It allows us in turn to follow closely the developments of the local economy and provide the right solutions to our partners.” Furthermore, the bank is governed by a board of directors comprised of experienced financial experts boasting illustrious careers spanning in a variety of banking disciplines, which provides the depth and experience needed to guide the bank and take it forward. 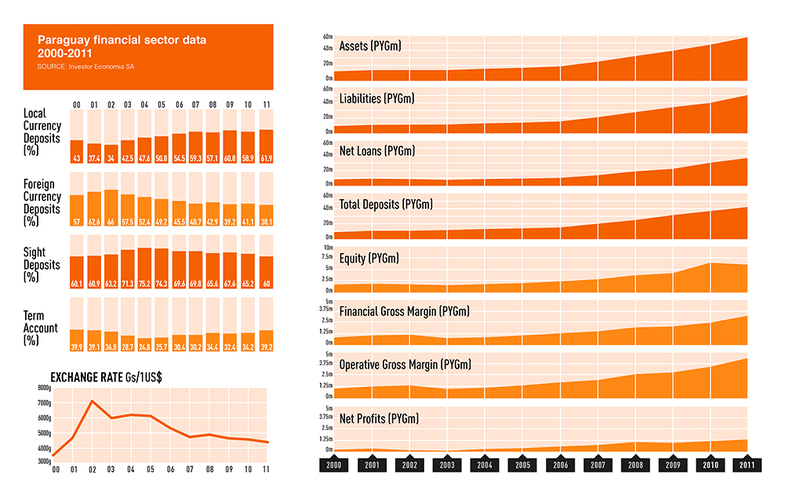 Sudameris Bank offers clientele a top quality portfolio, liquidity and financial systems competency. The bank has over 25,000 corporate and individual clients. In line with the economic fragmentation of businesses in Paraguay, Sudameris specialises in providing retail banking services that cater for personal, business, banking for SMEs and potential new clients looking to invest in Paraguay. Sudameris also boasts assets of more than $800m and an approximate net worth of $80m. The bank’s total assets have grown 31 percent in 2011 alone, reaching the objectives formulated in 2009 one year earlier than projected. Sudameris Bank believes that Paraguay’s success is due in part to the institutional, regulatory and fiscal changes implemented by the various governments over the past eight years. And, as an institution that has been in tune with these developments – as well as one that has catered for the growing needs of the country’s home grown industries – is passionate about reaching out to those looking to invest in Paraguay, as well as sharing with the world what the new Paraguay is all about.